I am falling in love with this place! Last weekend I went there in the evening for a quick bite. Its located at Woodhouse Road, Colaba. 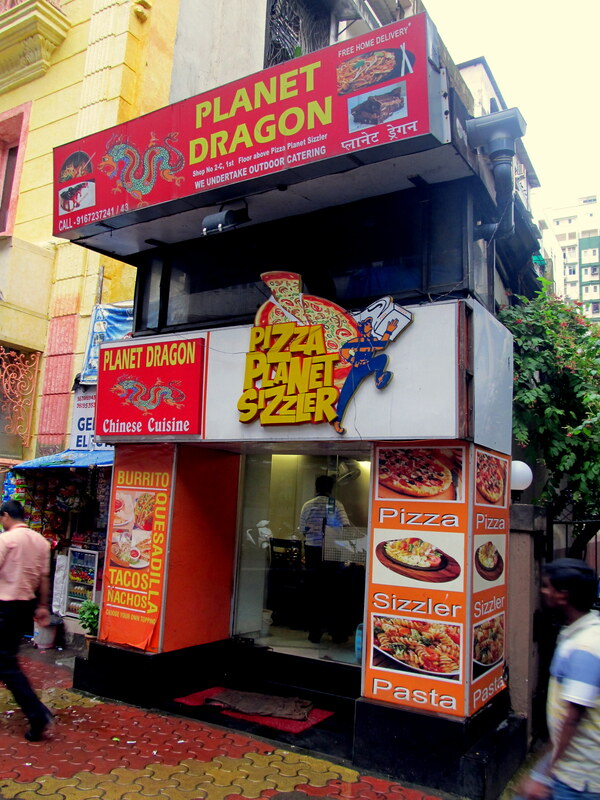 Pizza Planet Sizzler is actually a home-delivery concept restaurant, but accommodates walk-ins (like me). They have just 2 tables with 4 chairs each. I enjoyed sitting there, eating hot food with a chilled Coke and watching it rain outside. 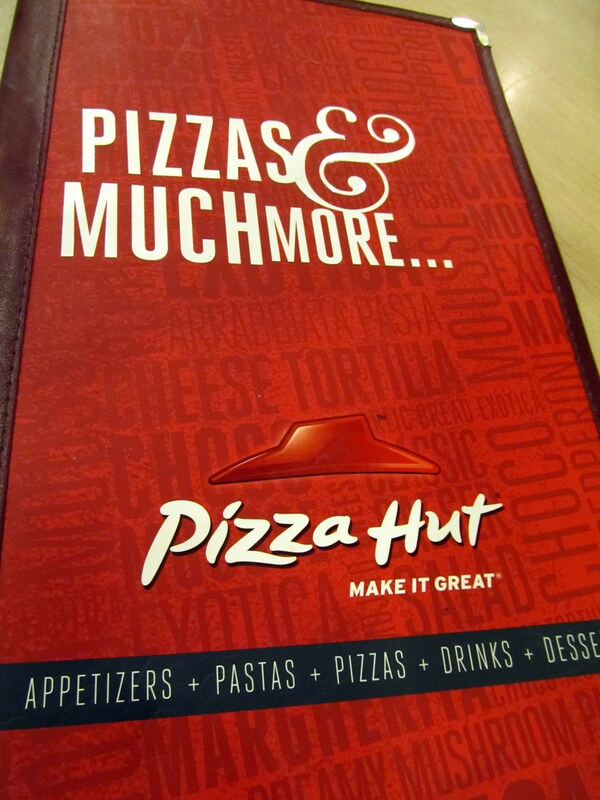 I ordered my favourite snack – Chili Cheese Toast, a Coke and my hubby ordered an 8″ Chicken Barbecue Pizza. The food arrived in 10 minutes. 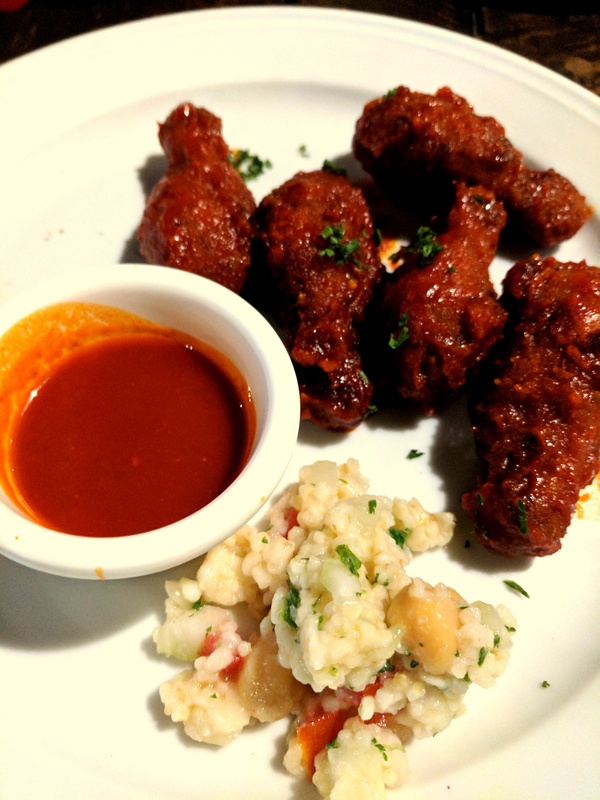 The food – piping hot and the drink – chilled – PERFECT! The Chili Cheese toast was excellent. 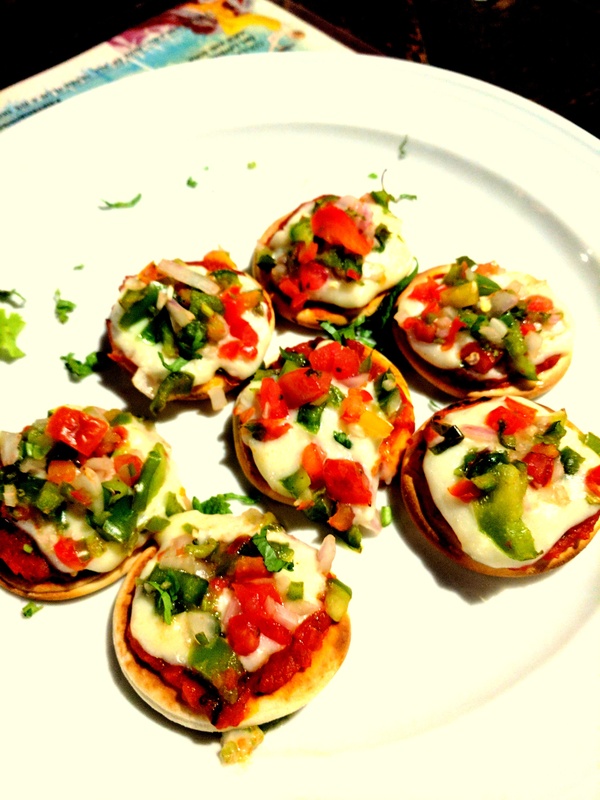 It just had a tad too much of coriander but the flavour was robust – delectable cheese-burst in the mouth with just the right amount of hot chilies. I added a few drops of Tabasco to give it an additional zing -yum….. This gets an 8 on 10 rating. Priced at Rs. 16o. 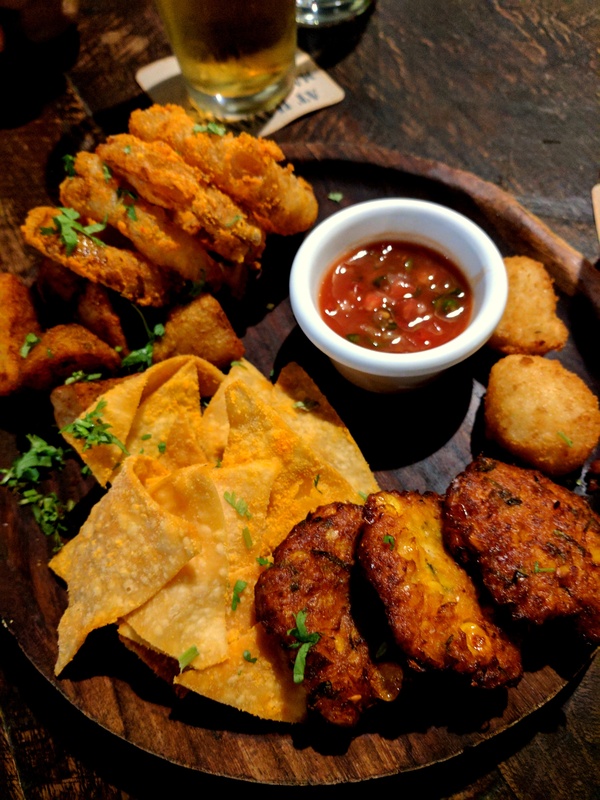 It would be nice to share these 8 pieces if having it for a quick bite or then its just right for a wholesome snack. 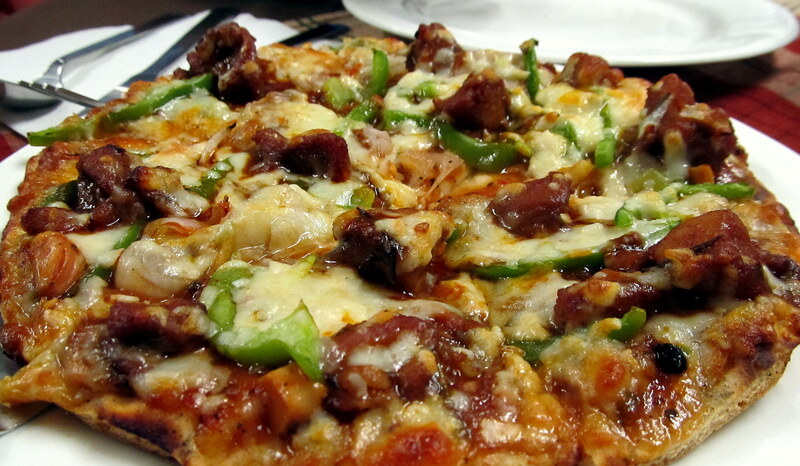 The Chicken Barbecue Pizza was fantastic as well. Perfectly made, priced at Rs. 260, its an absolute delight. It gets an 8 on 10 as well. Its got a good amount of chunky chicken especially when you compare the size and number of pieces you would get from another pizza place, say a Domino’s. Tonight for dinner, I ordered home a Vegetable Shashlik Sizzler. 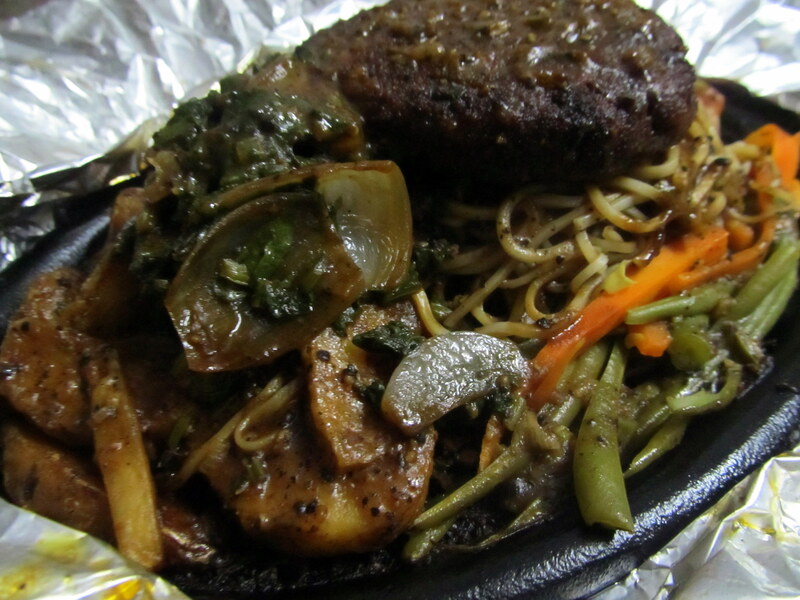 Its a sizzler with a veg patty, spinach, veggies, potato wedges and noodles in pepper sauce. I was told the delivery time would be 30-40 minutes and voila – my doorbell rang in 30 mins. Piping hot sizzler delivered to my doorstep avec sizzling plate as well. (they said they would collect the sizzler plate the next day). The top of the plate came enclosed in foil, so you can really imagine the food was really very very hot. We actually had to wait a couple of minutes before diving in, to eat! I give this a 9 on 10 rating. Only a very hearty eater can finish this on his own, else it does require a bit of help to finish-up the plate. Just the thing to eat on a rainy night at home. Its priced at Rs. 475 – reasonable but would have preferred it if it was priced slightly lower. But I still will order this when I feel like a pepper sauce sizzler. I would highly recommend this place for ordering a great meal at home. ANYTIME. I had vouchers for this place. Decided to use it tonight. Went there with hubby for an early dinner. 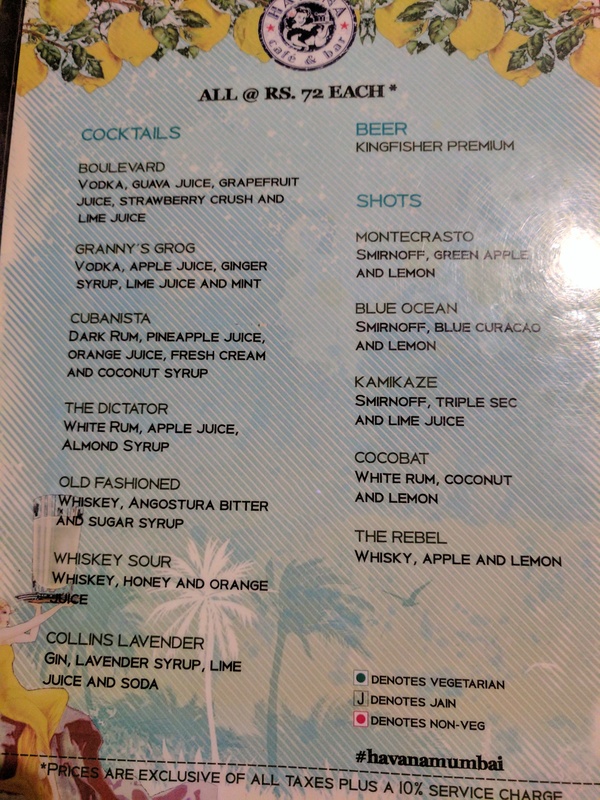 The menu looked amazing. I wanted to try out so many dishes, as the pictures of their food were just too tempting. I decided that, with so much to want to eat, I would have to come back here a couple of more times. However, once the food started coming, my liking for the place started diminishing. As a starter we ordered the Spicy Supreme garlic bread. 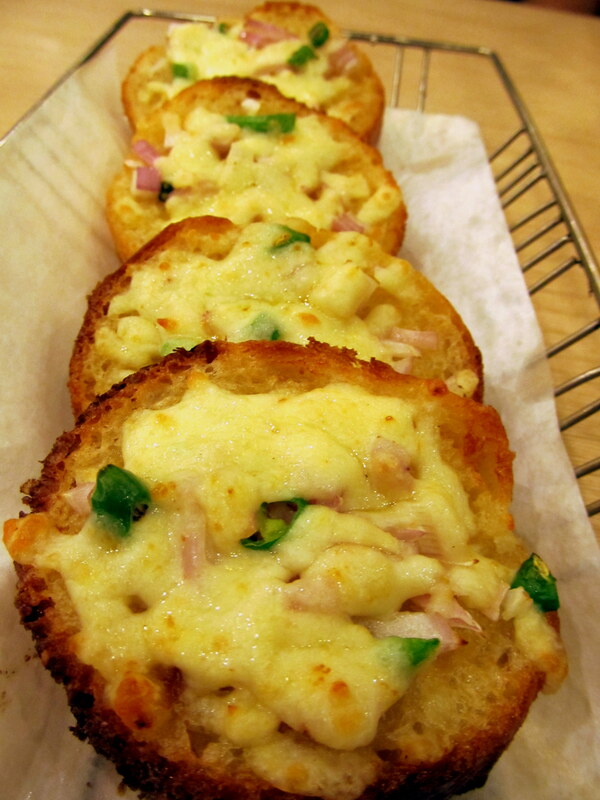 4 pieces of bread, topped with cheese, onions and green chilies. What we saw in the picture is very different to what we were served. The cheese amount was just passable. 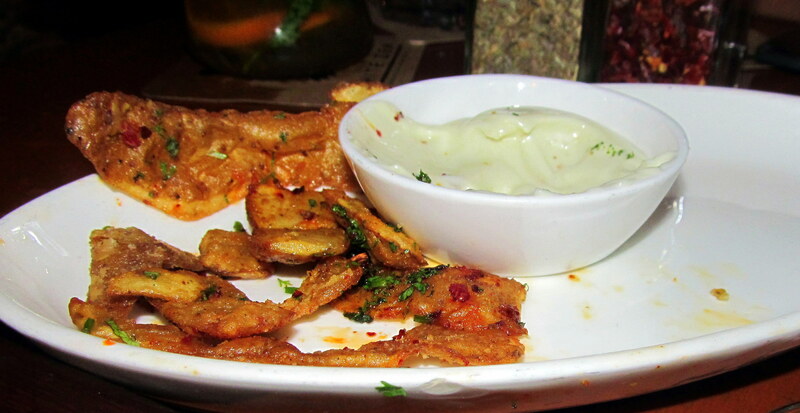 The onions and green chilies were so badly cut – the sizes of each piece differed for the other. The taste – NOT HAPPENING. 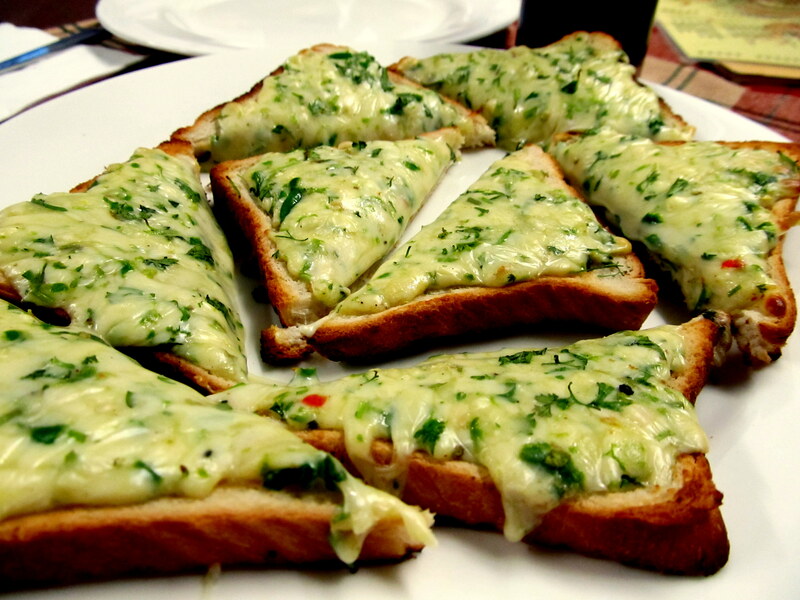 I make better cheese toast at home! Next as a main course, I ordered a So Cheezy Classic Cheese pizza and my hubby a So Cheezy Super Chicken Twist – each sized a personal pan. For the Super Chicken Twist, hubby dear played with himself ‘spot the chicken pieces if you can’. Finally I think he counted 5 pea-sized pieces of chicken! He did not enjoy the pizza which was priced at Rs. 299. At Rs. 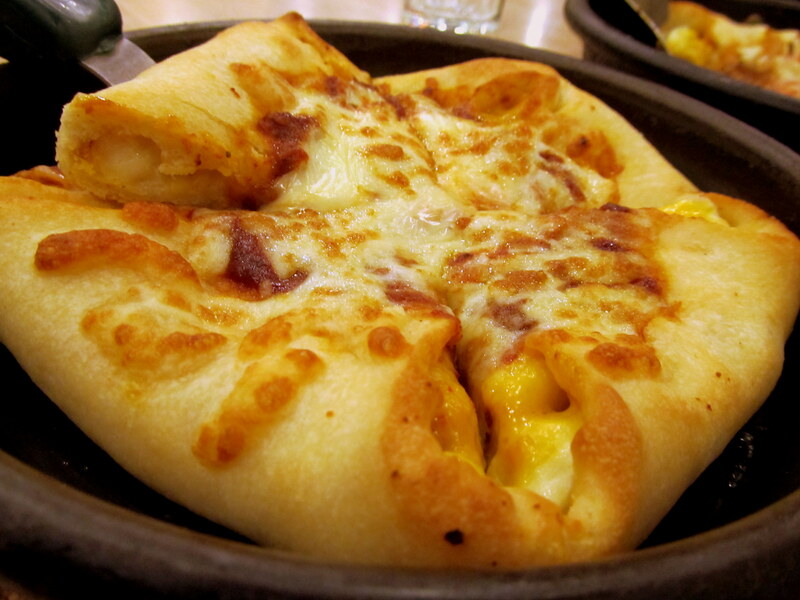 179, luckily one cannot really go very wrong with a cheese pizza – I was saved. Decent but nothing great. I would have preferred a Domino’s Cheese Burst pizza anyday to this. After not-a-good-meal, my hubby decided not to venture into ordering anything more for himself. 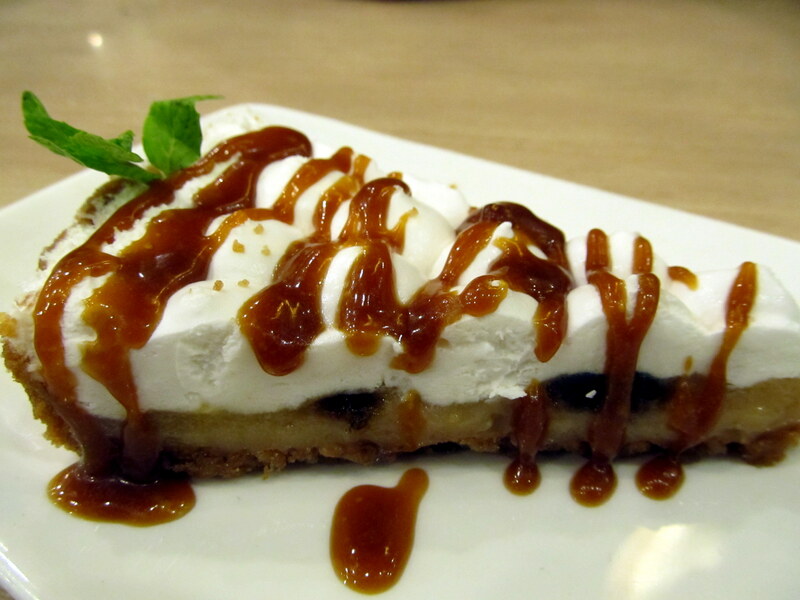 I decided to continue the meal by ending it with a Banoffee pie (the picture of it is so inviting in the menu). Price Rs. 125. Looks quite good but tastes just about ok. It would be a very good attempt if it was made by a home-cook. But to expect this from a leading restaurant chain? Unacceptable. I love this place. During a period of 1 month, I would have visited this place about 5 times! I have the pics of all the food I have eaten there except their Chutney n Cheese sandwich. Its really good. The sandwich reminds me of the one you get at NCPA when attending the theatre there. Only difference is that the sandwiches at Leo’s are bigger with more chutney and cheese. Priced at Rs. 60. Recently for dinner, I had their Danish Croissant and Veg. Quiche. 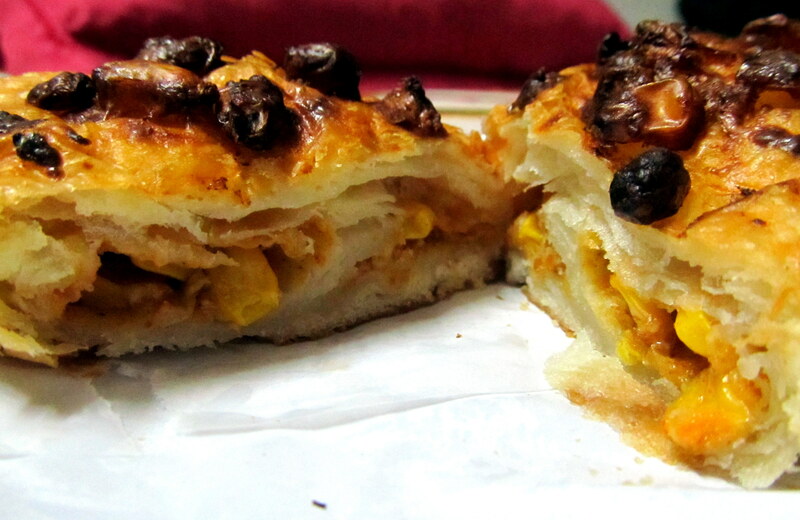 The Danish croissant has a corn and cheese filling with corn sprinkled on top of the croissant. 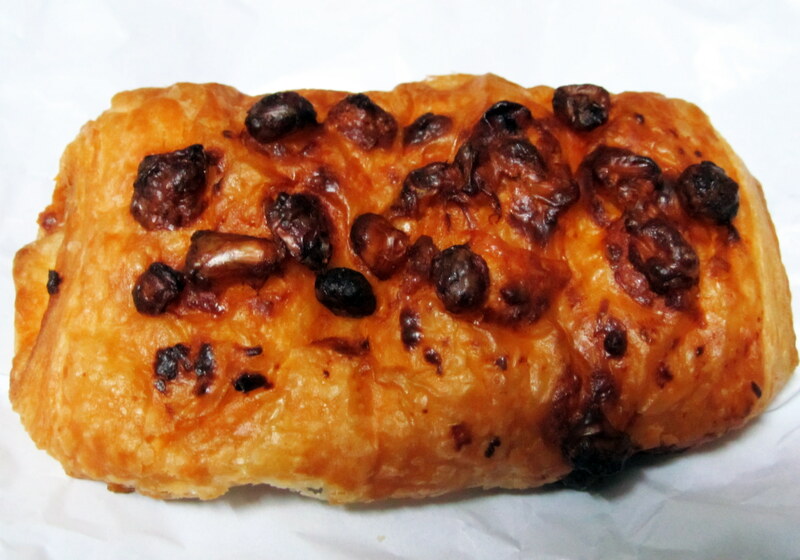 I loved picking out the burnt corn and eating it and then I dived into the croissant. Its a lovely croissant. The Veg. 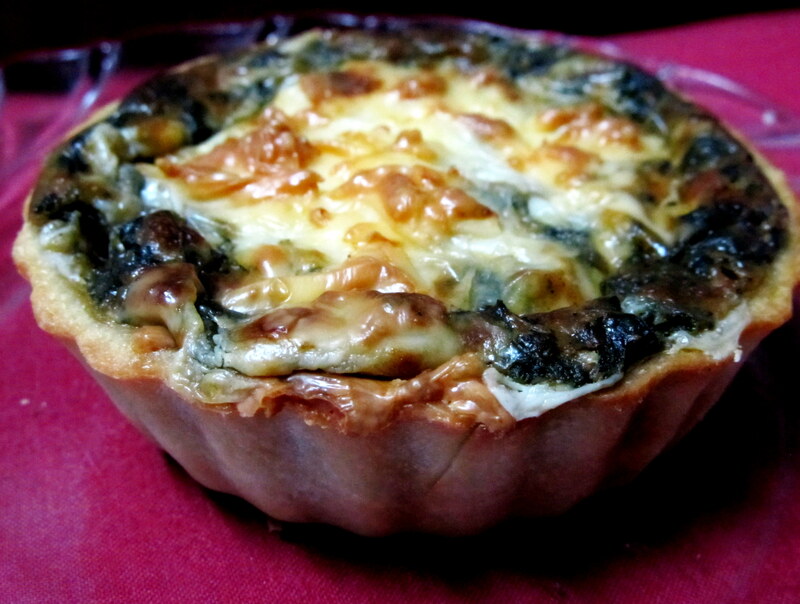 Quiche is a spinach, mushroom and cheese person’s delight. 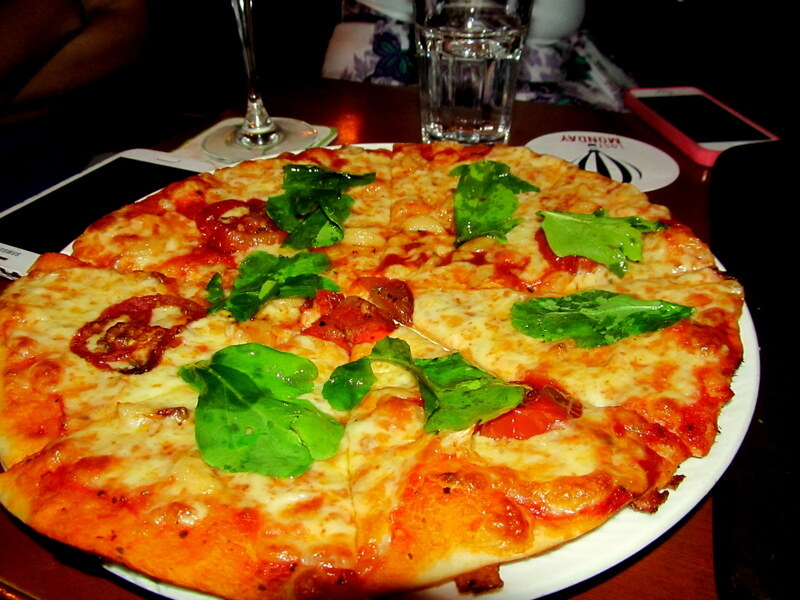 Its got a lovely texture and is almost a melt-in-your-mouth savoury. It looks like a medium sized quiche but it packs a load of taste. For its size, its quite a tummy-filler. 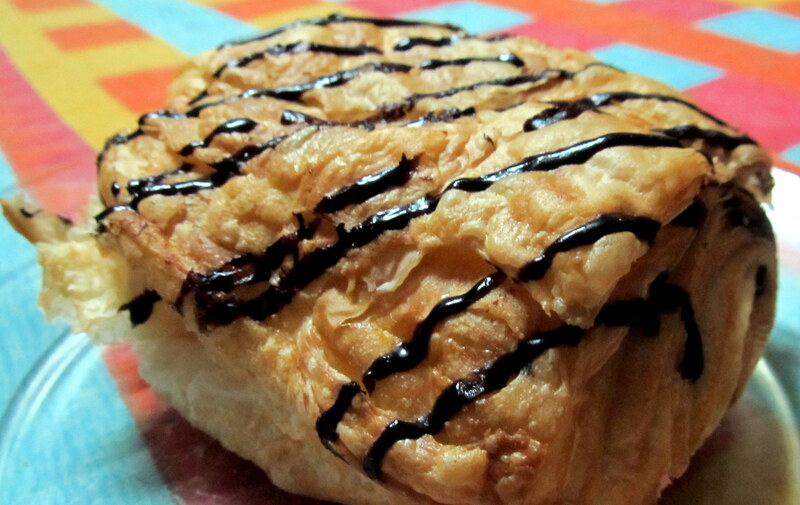 Its a nice big-looking croissant. Looking at it makes you salivate. However, it flattens on pressing it slightly and fits well into the mouth. 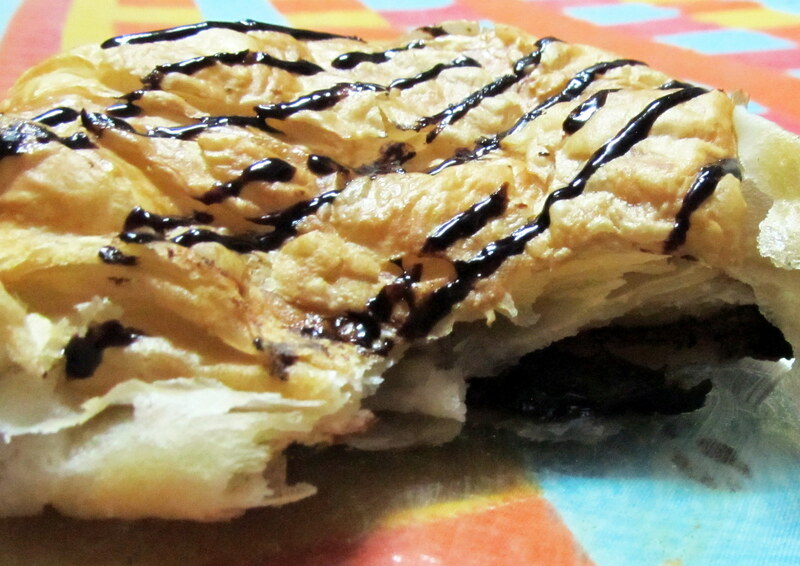 The chocolate flavour is good but find the layer too thin. I would have preferred if the chocolate layer was a tad bit more. However, I would still pick it up as an after-meal dessert if my meal has been a light one. 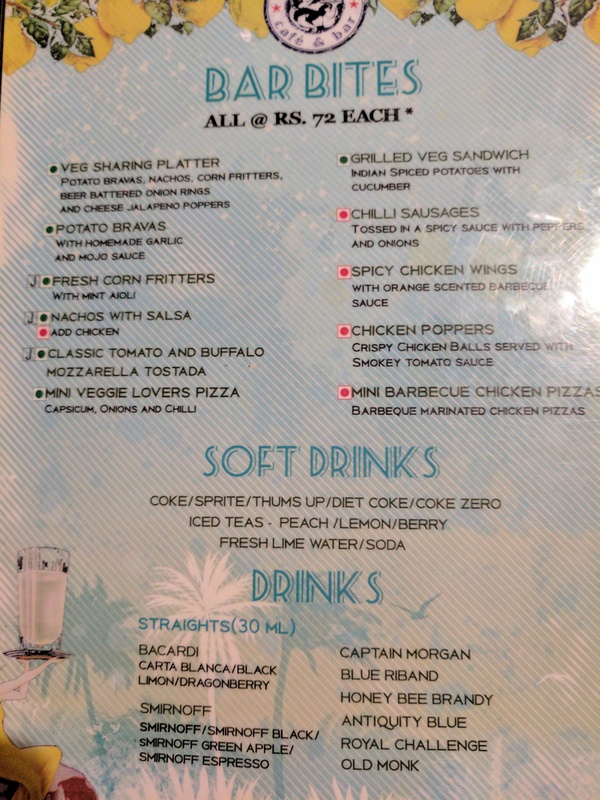 All the three savouries above are priced at Rs. 50 each. I’ve eaten the veg pizza twice. The first time, I liked it a lot. However, the second time, though the taste was the same, it had a strong flavour of garlic, which I didn’t like – so will be hesitant to pick it up again. 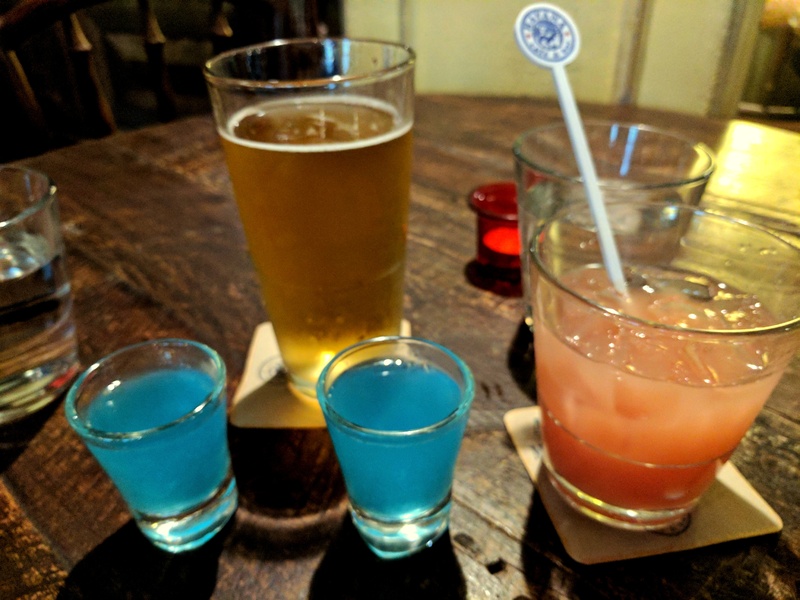 Yet more things to try at Leo’s ! 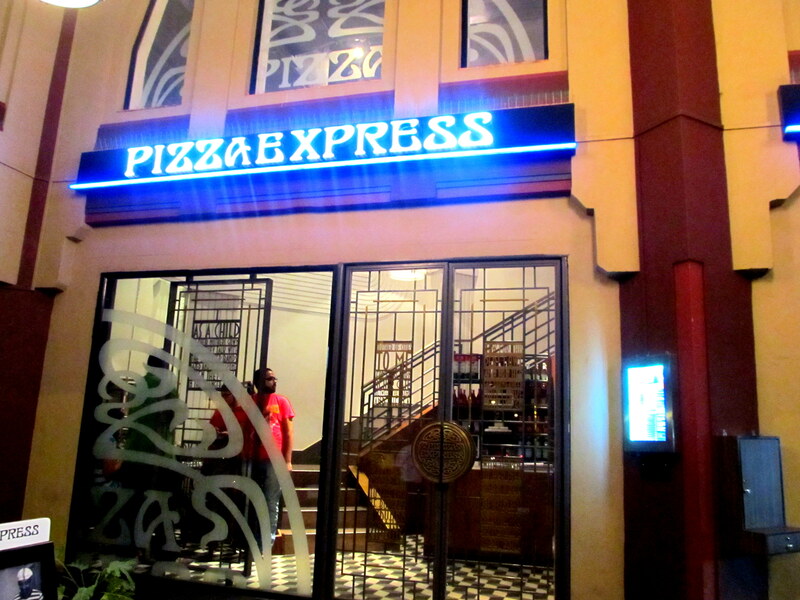 Located at Colaba, Pizza Express is just a minutes walking distance to The Gateway. I love the decor as well as the way the tables are spaced out. The layout offers enough privacy as well as gives you the open-look at the same time. The staff are courteous and well informed. As it was just an eat-in for 2, we ordered a diet Coke (Rs. 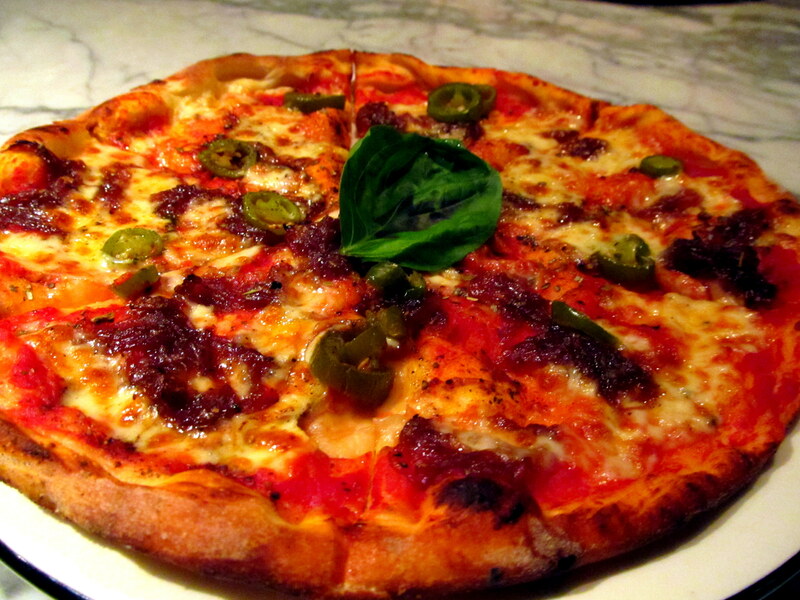 115), a Romana – American Hot with jalapenos. 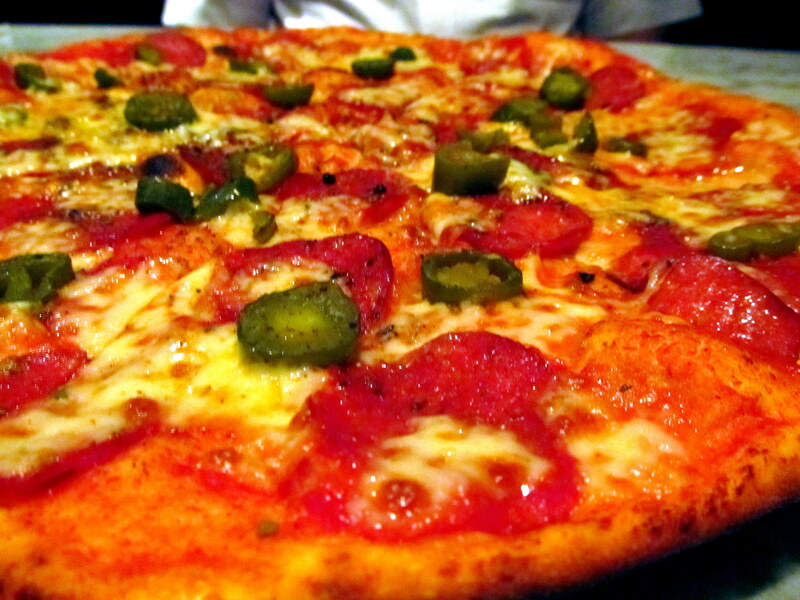 This is a 14″ stretched out thin pizza with pepperoni, mozzarella, tomato and choice of jalapenos or roquito (Rs. 640). Also ordered a Classic Margherita with additional toppings of jalapenos and caramelized onions (Rs. 390 +Rs. 40 +Rs. 40=Rs. 470). Total bill with taxes as well as their 10% service charge came to Rs. 1,439. The pizza were great. 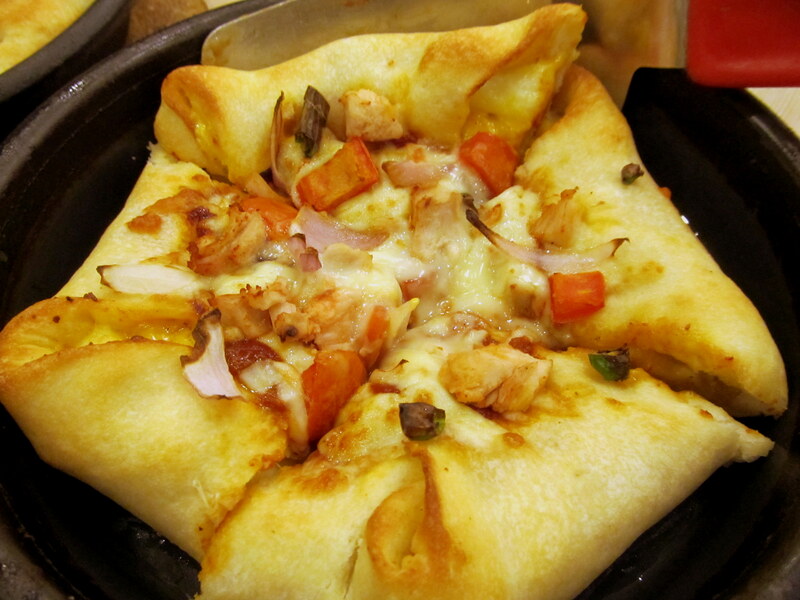 The American Hot was very appeasing. I was totally happy with the vegetarian one as well. However, probably the next time I may not add caramelized onions and try another topping. 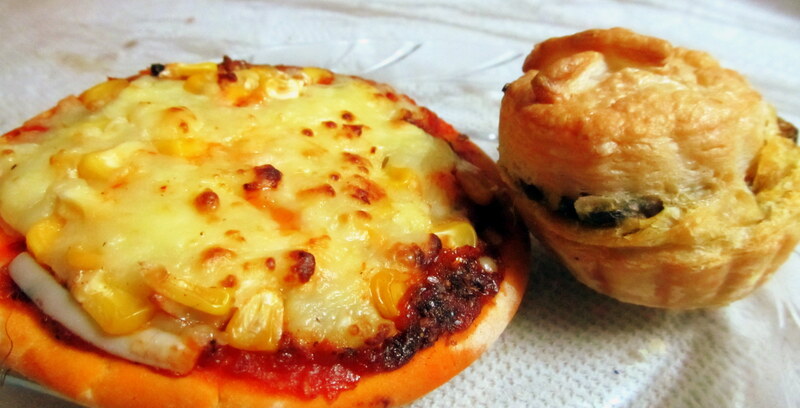 Flavours of both pizza were wholesome. Had a good meal. Would definitely recommend all pizza lovers to eat here. I shall go back for more.